Australian manufacturer RØDE recently announced the smartLav, a unique lavalier microphone for Apple and Android portable devices. 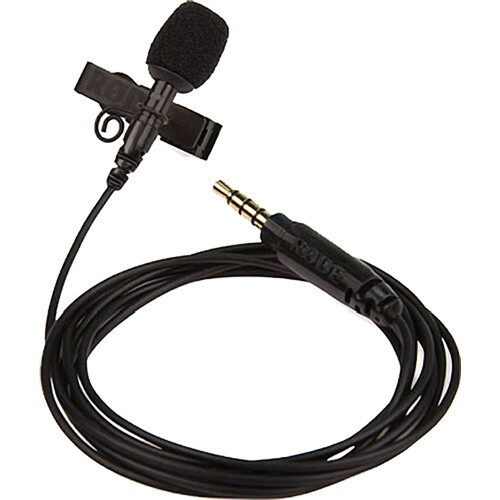 It's specially designed to bring high quality, discreet audio-recording capabilities to videographers, journalists, lecturers and others—without the need for expensive and complicated equipment. S etting up to record with the smartLav is surprisingly quick and easy. Just secure the smartLav to the supplied clip and fasten it to your shirt or lapel. Next, run the smartLav’s 45” wire inconspicuously through your shirt or jacket and plug the standard TRRS connector directly into the headset jack of your smartphone. Then, just load up your favorite audio app, slip your device in to your pocket and you’re ready to record. One or more smartLavs used in tandem with compatible smartphones or tablets can be used to capture lectures, interviews, wedding ceremonies and more. In addition to being easy to use, the smartLav is also designed for top-notch sound quality. It employs a sensitive condenser microphone capsule that features an omni-directional polar pattern. The capsule, which is powered solely by your mobile device, picks up sound equally from all sides of the mic. There is also a foam windscreen included to help keep vocal plosives, wind and clothing noise from causing obtrusive pops in your recordings. Although the smartLav is compatible with any recording app that will receive audio from the headset input, RØDE has designed the mic specifically to pair with their RØDE Rec app for Apple iOS devices. The app allows you to record, EQ, edit and publish your audio to SoundCloud or Dropbox directly from your device. For more information, stop by the B&H SuperStore and speak with a sales professional in person, over the phone at 1-800-606-6969 or via Live Chat. Great idea. Is there an extension cord that can be used for video recording as 1 metre is to short for recording video on phone. What could you recommend? The 23.6" Input Output Extension 1/8" Male TRRS to 1/8" Female TRRS Cable from IK Multimedia can be used as an extension cable for connecting wired accessories, such as headsets or IK Multimedia's iRig, iRig MIC, or iRig MIC Cast to your iOS device. It has 24K gold-plated connectors and shielding to provide protection against EMI. It will record the audio to the video you are shooting with your Galaxy device.